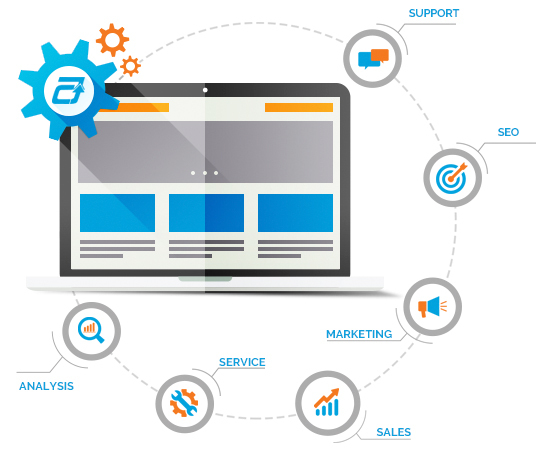 Autoxloo offers a complete Dealer Management Solution and Vehicle Stock Software that allows automotive dealerships to be self-sufficient and develop a complete and effective online advertising platform. For those vehicle dealers who prefer to outsource the day-to-day requirements for managing their online sales and marketing program, AutoXloo developed Consumer Assistance Program (CAP). We can provide a range of different functions and possibilities, covering all the day-to-day dealer website requirements. Autoxloo provides a complete dealer stock management system to effectively showcase your vehicle inventory on the Internet. Dealer Website Platform gives our clients 100% control of the look, feel, layout and content of their dealer websites. A good combination of responsive dealer website, real-time analytics, lead conversion management and nifty widgets will give your vehicle inventory such benefits as the maximum online presence, a high visibility for your target audience and a vivid competitive advantage. We offer a completely “Hands Off” solution to posting your inventory on Classified stock listing services like Backpage, Ebay, AutoTrader and many others. This service can fit any budget. With our Dealer Management Solution you will be able to exchange your dealer’s stock with the most popular services in the UK. Powerful real-time analytics provides valuable incite as to how your customers find your site. Having access to the Stock Datafeed allows you to strategically adjust PPC campaigns, on site advertising and incentives to increase consumer participation and ultimately lead generation. We provide our dealers websites with unmatched automotive SEO technology to get your dealer website first page Google and Yahoo search visibility in your local national and even international market! There are four avenues that car dealer can use to improve websites’ SEO and online presence with our Vehicle Stock Software: website infrastructure to funnel customers to produce more leads; original content that people read, share and spread online; link relationships to drive targeted traffic to your dealer website; social media to build awareness and keep customers engaged. With Autoxloo’s Customer Relation Management you can track leads, measure win/loss ratio, convert leads into active clients and review history of tracking records. Customer Management Database is stored at one common location. Autoxloo integrated our CRM with Phone, SMS, Live chat and Email Marketing. It can function both independently or integrate with existing business processes and moreover Autoxloo Dealer Stock Management System. Live chat increases the amount of leads and helps you develop a relationship between customers and your brand. Autoxloo’s CAP Valuation tool are designed to give each department and its respective staff in your car dealership a unique user access to interact with your potential customers. All the contact history is stored in Dealer Stock Management System. Autoxloo’s Reputation Management Service is the most cost effective way to ensure your online reputation is protected and improved each and every day. Do not lose new Buyers due to bad customer reviews, negative opinions and comments. We understand Internet marketing for automobile dealerships. Enable your visitors to share what they have found on your site with others through social networking by our Social Media Marketing software. Facebook, Twitter and Pinterest are just a few of the over 50 ways your visitors can use to virally advertise your stock and drive more traffic to your dealer website. Autoxloo’s mobile platforms let car dealers to upload vehicles and images seamlessly in under a few minutes for each vehicle. Our mobile designs are just as flexible as the desktop version of our platform. Our module Slingshot Mobile™ works by scanning the vehicle’s VIN, taking a few pictures and navigating point-and-click menu which will describe how the car was utilized in the past. Autoxloo created the e-Magazine or In-car specification sheet that behaves like a normal hard copy of traditional magazines just on the computer screen. Our Silent Salesman deliver instantly all your vehicle stock profiler information to the customers with no print cost, no distribution, and no postage cost. Our Vehicle Inspection Report™ software provides storage, reporting and data distribution capabilities your vehicle auction needs to be competitive in today’s market. With Autoxloo’s VIR ™ dealerships can specify vehicle health check, be familiar with vehicle provenance and grade vehicle for each component. We have created the fully automated Buyer’s Guide, Window sticker and Addendum module that is integrated with your dealer website. Autoxloo proprietary algorithm can establish the exact Mechanical Breakdown Insurance available for your vehicles using your existing car warranty vendors offerings. No more handwriting the year, model, make or any other information you want on the buyer’s guides. Buyer’s Guide Automation meets Turnkey technology. Autoxloo offers a full range of multimedia functionality: text, graphics, audio, photo images, animation, full motion video, data etc. Web 2.0 technology supports latest multimedia options online. To showcase your automotive dealership and stock use our professional and customizable Vehicle Stock Software: Make-A-Page 2.0™ to make changes to your website any time of the day without any technical experience; Make-A-Form™ to create your own forms in only a few minutes; Make-A-Coupon™ to get complete control over your coupon contents; Make-A-Template™ to post your advertisements to eBay, Backpage; Photobox and Canned Images to upload lots of photos and advertisements between stock images.